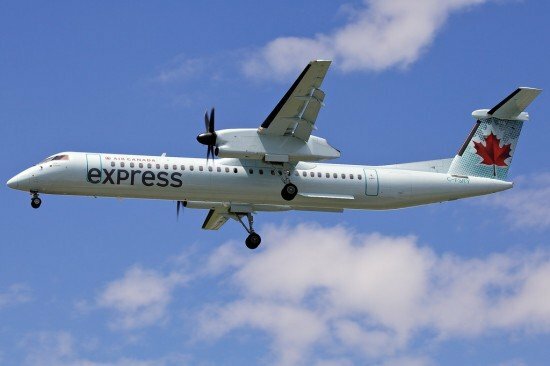 The Transportation Safety Board of Canada (TSB) released its investigation report of a risk of collision occurrence, when a passenger aircraft crossed an active runway while a twin-engine turboprop aircraft was taking off at the Montreal/Pierre Elliott Trudeau airport in August 2011. On 29 August 2011, a Sky Regional Airlines Bombardier DHC-8-402 with 25 passengers and 4 crew members aboard landed on runway 24R at the Montreal/Pierre Elliott Trudeau Airport. After landing, the ground controller gave the crew taxi instructions to the gate, which included stopping before runway 28 until instructed to cross it. The DHC-8 flight crew read back the instruction correctly, meaning that they understood and would comply. Meanwhile, the air traffic controller cleared a Beechcraft King Air with 3 crew members aboard to take off on runway 28. Two minutes later, the DHC-8 entered runway 28 without stopping, while the King Air was nearing takeoff speed. The King Air aborted the takeoff and while slowing down, veered right on the runway centerline and passed about 40 feet behind the DHC-8. There were no injuries; however, the King Air had some minor mechanical damage related to the rapid deceleration. While the ground controller was instructing SKV7516 to hold short of Runway 28, the pilots’ attention was focused on an aircraft taxiing in the opposite direction. As a result, the SKV7516 pilots did not confirm between themselves the ground controller’s instruction to hold short of Runway 28, and resumed taxiing. The SKV7516 flight crew members incorrectly believed that they were permitted to cross Runway 28 notwithstanding the first officer’s accurate readback of the instruction to hold short of Runway 28. As a result, SKV7516 did not stop at the hold line and entered the runway. The visual scan conducted by the SKV7516 captain was ineffective and did not identify that PRO104 was on Runway 28. SKV7516 crossed Runway 28 without permission in front of PRO104, which was approaching its take-off rotation speed. Consequently, the runway incursion resulted in an extremely serious risk of collision. If an aircraft inspection is not conducted following a high-speed rejected take-off, there is a risk that a flight crew may take off with a damaged aircraft. If a flight crew is tuned to an incorrect frequency as that crew’s aircraft crosses a runway, there is an increased risk that the ground controllers and airport controllers will not be able to contact the flight crew. In the absence of additional strategies to safeguard against runway incursions, the risk of collisions on runways will persist. Since this occurrence, Sky Regional Airlines has modified its checklists to reduce distractions while taxiing and issued safety bulletins to ensure crews follow standard operating procedures (SOPs) to prevent runway incursions. The Montreal/Pierre Elliott Trudeau Airport has improved signage on Taxiway Echo on either side of Runway 28 and established a local runway safety committee. 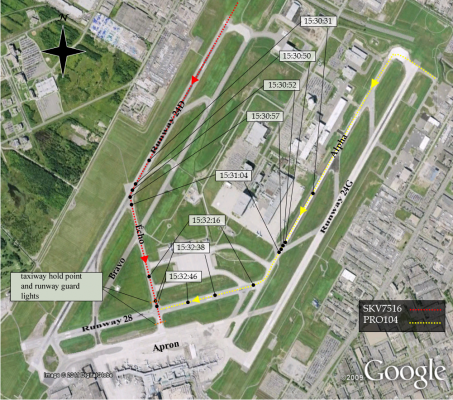 NAV CANADA has also implemented procedures to reduce runway incursions.